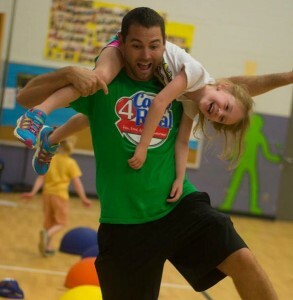 Our staff of PE teachers offer a wide variety of fun programs and healthy activities for campers ages 5-13. All programs are created with the intention of providing campers with the fun of PE classes and the motivation to inspire a healthy and fit lifestyle. Camp4Real is better than PE though because it is much longer than our normal forty-five minutes! 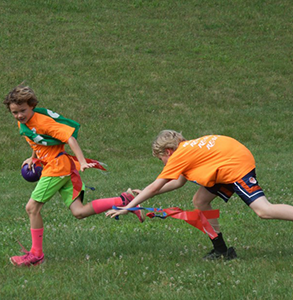 We strive to show our campers that it is easy to eat healthy, but also quite fun! Snacks are provided on a daily basis and give the kids something every child loves – choices. 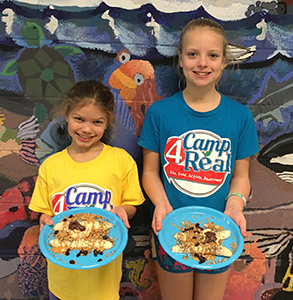 Plus, each camper is able to create their own meal of healthy foods to empower them to take healthy eating habits home to pass them on to the rest of the family. Every snack is met with great enthusiasm from our campers! Each Camp4Real camper will enjoy our fitness based programs designed to provide a total body workout in a fun way. Plus, we will discuss how each of their favorite games addresses various fitness components. 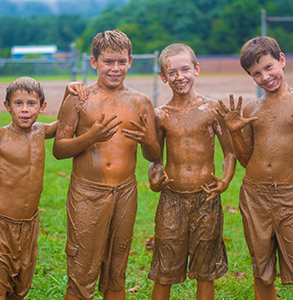 There is no disguising of fitness at Camp4Real as we celebrate fitness every day! We will have a more active community if we love our fitness. This covers the whole spectrum of the camp and includes: The games we will play; the snacks we will create and eat; the nutritional knowledge we will attain through our discussions, label reading, and nutritional experiments; the character we will develop through our cooperative activities, character-building games, and Camp Buddies program; the leadership to take these healthy habits and behaviors and pass them on to our family and our community.